FFM: Do We Need More Progressive Taxes or Free Markets? Do We Need More Progressive Taxes or Free Markets? There is much talk about the President's commission on how to regain control over the federal deficit. Many constituents are advocating a more progressive income tax structure saying that it was the wealthy that benefited disproportionately from the asset bubble and sub prime lending that drove our economy into the ditch. Since they drove us in the ditch, they should pay the cost of getting out of the ditch. It is hard to disagree with this logic, however we also need to consider what were the causes of the growth in the disparity between the wealthy and the middle class as depicted by the chart below. 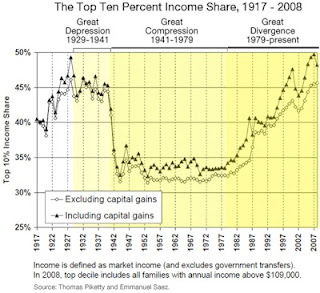 It is no accident that at the same time when the disparity was increasing, 1979 to 2006, corporate power in this country was increasing at the expense of free markets and capitalism. Why are the people who are against big government not against big, oligopolistic, business? Just as the Tea Party opposes big government because it chokes capitalism and free markets, so does businesses that control "free markets" and capitalism. Capitalism works when there are many producers, corporations, looking out for their rational self interest by producing the goods and services that the consumer is looking for when they are seeking their own rational self-interest. Free markets are destroyed when a company or a small group of companies, an oligopoly, control a market for certain goods and services. This occurred in the past in the auto industry and is now occurring in telecommunications, health insurance, computers, banking, Wall Street and others. The role of the Board of Directors and management of a corporation is to maximize the wealth of its shareholders. Under capitalism and free markets this occurs by providing the best products at the lowest prices to the consumer, the citizens. In free markets it is in the rational self-interest of each corporation to best meet the needs of the consumer. From the corporations standpoint, a better way to maximize the wealth of the shareholders is to control the market. Ideally this is done by creating a monopoly. If that can't be done, then create an oligopoly. By creating an oligopoly a corporation needs to be less concerned with what the consumer wants and minimizing the price to the consumer. The consumer has limited choices so there is less need to focus on the consumer. In an oligopoly, it is in the best interest of the company to keep the oligopoly alive. Therefore, the Board of Directors of a corporation is willing to pay egregious salaries to its management to foster the growth and development of the oligopoly and because they need to be less concerned about holding down cost because the consumer has no place else to go. Therefore, progressive taxation does not solve the problem. The problem is we are losing our free markets and capitalism. It is time to do something about this. Robert C. Lieberman published an current article in www.foreignaffairs.com "Why the Rich are Getting Richer." Essentially, in my interpretation, it's about how Reagan, Bush and the Republicans of that era high-jacked America.